"I don't preach a social gospel; I preach the Gospel, period. The gospel of our Lord Jesus Christ is concerned for the whole person. When people were hungry, Jesus didn't say, 'Now is that political or social?' He said, 'I feed you.' Because the good news to a hungry person is bread." I trust Desmond Tutu's words over Glenn Beck's. Even if you marginally agree with Beck on occasion, don't join him in his brand of paranoia which looks for "code words" for communism even in the language of love. Michael Hidalgo, Lead Pastor at Denver Community Church, wrote a really good hearted and warm response to Becks words. His gracious response really helped me keep my temper. Read his post A Pastor's Response to Glenn Beck's Call to Leave 'Social Justice' Churches at Sojourners. Scot Mcknight also posted a great post on this. Beck's comments have to be filtered through the fact that he himself is a Mormon. If one inclusivist enough to include Mormonism under the umbrella of Christianity, it would seem that one would also have to accept Beck, his insane (and decidedly non-biblical) views and all. I don't mind if he wants to call himself a Christian. Religious Christianity can be a big tent. But, even so, he remains "mean, nuts, anti-Christian..." and I can think of a few other Christians (who are not Mormons) who fit the same mold. I think that I have to claim Beck along with the Mormon church at least in some ways... if only because he appeals to the same Bible to which I appeal. Beware of secular progressives, socialists and yes, of course, communists and nazis. All of these will lead you away from God! Perhaps you were not taught the history of early 20th century communist Russia or fascist Germany, but today you can see the effects of socialist secularism in most European countries and the beginnings here in America. God is being removed from our lives like never before. 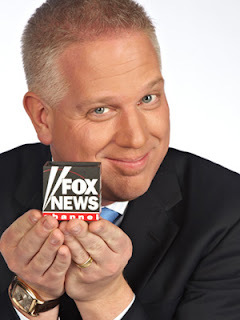 Glenn Beck is trying to warn you that if your church has been influenced by today's secularism to the degree that "social and economic justice" are deemed rights of all people then you should seek a church where these are righteous goals based upon one's need and satisfied through the charity, love, ministry and assistance of others, rather than mandated by law and "solved" through various programs with no need to thank God or anyone else for their help and no need to change their lifestyle because the government will give them everything they need EXCEPT humility, gratitude, encouragement and faith. We are God's children, not Washington's. Glad to see you are not wearing political blinders and are involved! We are indeed God's children and not Washington's! I am in total agreement with that. And this is precisely why "social and economic justice" are "rights" of all people. Social justice, in terms of the Kingdom of God, isn't about the creation of "systems" but the implementation of Christ's work on the cross. This makes social justice essential to the gospel. And it means calling out systemic injustices wherever they arise and calling our government to create avenues for justice and charity. Some would call this "favoring the poor" and I suppose that Beck would be against that... Jesus, however, not only favored the poor but shared his identity with them. Thanks for the comment... it's not always about agreeing but learning to disagree well.